Atmospheric pressure is also known as barometric pressure and is measured with a barometer. [Figure 2] Expressed in various ways, such as in inches of mercury or millimeters of mercury, these measurements come from observing the height of mercury in a column when air pressure is exerted on a reservoir of mercury into which the column is set. The column must be evacuated so air inside does not act against the mercury rising. 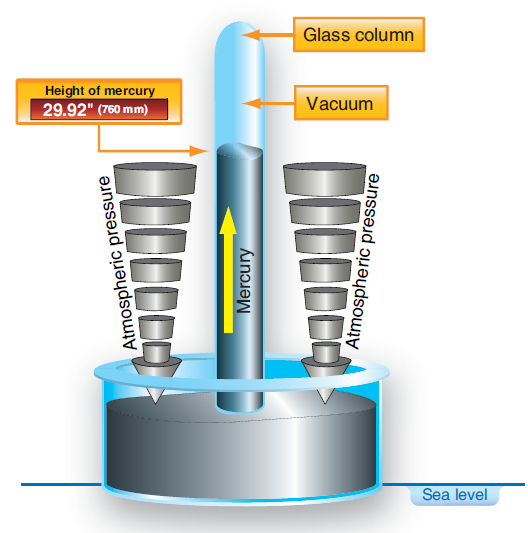 A column of mercury 29.92 inches high weighs the same as a column of air that extends from sea level to the top of the atmosphere and has the same cross-section as the column of mercury. Atmospheric pressure decreases with increasing altitude. The simplest explanation for this is that the column of air that is weighed is shorter. How the pressure changes for a given altitude is shown in Figure 4. 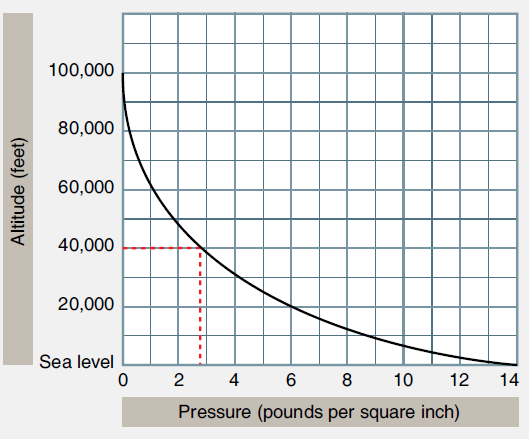 The decrease in pressure is a rapid one and, at 50,000 feet, the atmospheric pressure has dropped to almost one-tenth of the sea level value. Temperature variations in the atmosphere are of concern to aviators. Weather systems produce changes in temperature near the earth’s surface. 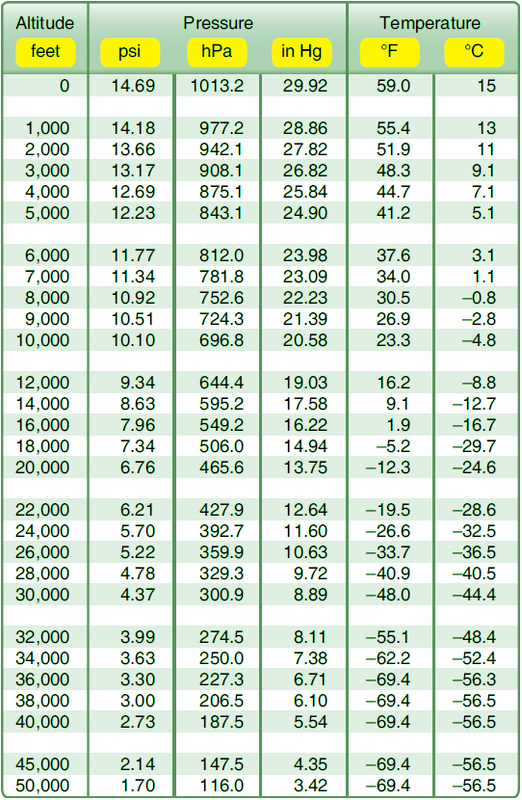 Temperature also changes as altitude is increased. The troposphere is the lowest layer of the atmosphere. On average, it ranges from the earth’s surface to about 38,000 feet above it. 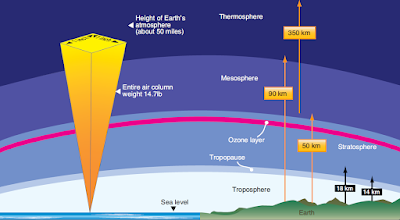 Over the poles, the troposphere extends to only 25,000–30,000 feet and, at the equator, it may extend to around 60,000 feet. 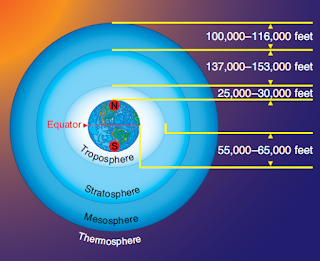 This oblong nature of the troposphere is illustrated in Figure 5. Most civilian aviation takes place in the troposphere in which temperature decreases as altitude increases. The rate of change is somewhat constant at about –2 °C or –3.5 °F for every 1,000 feet of increase in altitude. 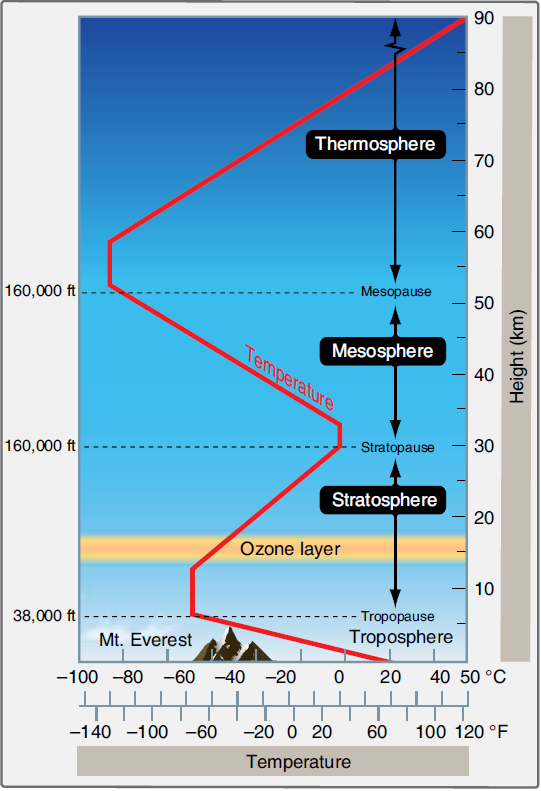 The upper boundary of the troposphere is the tropopause. It is characterized as a zone of relatively constant temperature of –57 °C or –69 °F. 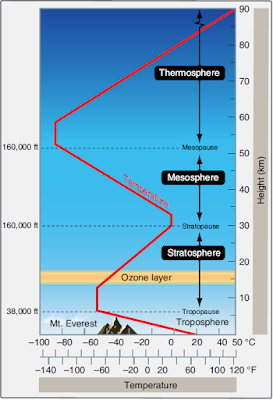 Above the tropopause lies the stratosphere. Temperature increases with altitude in the stratosphere to near 0 °C before decreasing again in the mesosphere, which lies above it. The stratosphere contains the ozone layer that protects the earth’s inhabitants from harmful UV rays. Some civilian flights and numerous military flights occur in the stratosphere. Figure 6 diagrams the temperature variations in different layers of the atmosphere. When an aircraft is flown at high altitude, it burns less fuel for a given airspeed than it does for the same speed at a lower altitude. 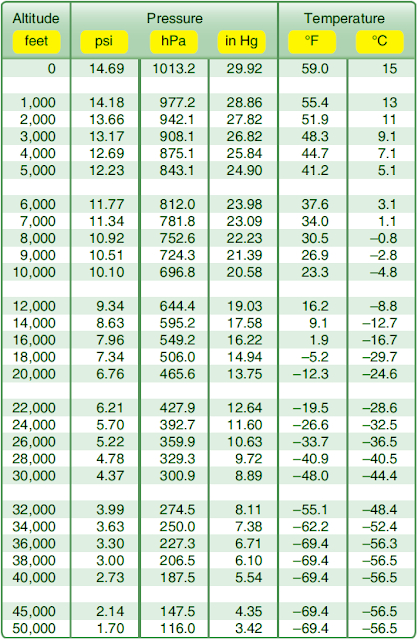 This is due to decreased drag that results from the reduction in air density. Bad weather and turbulence can also be avoided by flying in the relatively smooth air above storms and convective activity that occur in the lower troposphere. To take advantage of these efficiencies, aircraft are equipped with environmental systems to overcome extreme temperature and pressure levels. While supplemental oxygen and a means of staying warm suffice, aircraft pressurization and air conditioning systems have been developed to make high altitude flight more comfortable. Figure 7 illustrates the temperatures and pressures at various altitudes in the atmosphere. Cabin altitude—given the air pressure inside the cabin, the altitude on a standard day that has the same pressure as that in the cabin. Rather than saying the pressure inside the cabin is 10.92 psi, it can be said that the cabin altitude is 8,000 feet (MSL). Cabin differential pressure—the difference between the air pressure inside the cabin and the air pressure outside the cabin. 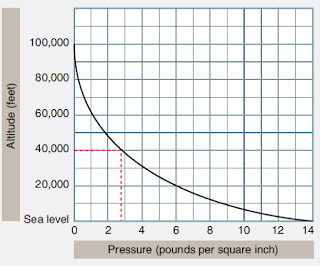 Cabin pressure (psi) – ambient pressure (psi) = cabin differential pressure (psid or Δ psi). Cabin rate of climb—the rate of change of air pressure inside the cabin, expressed in feet per minute (fpm) of cabin altitude change.